The new card will pay 2 percent in cash back on Apple Pay transactions, 3 percent on Apple purchases, and 1 percent on purchases with a physical card. Apple has unveiled its new Goldman Sachs-linked credit card, the Apple Card. Users can sign up through their iPhone and get access to the card in minutes, according to the tech giant’s Monday presentation. The new card hinges on Apple Pay, the tech giant’s mobile payment and digital wallet, which has made inroads in merchant acceptance since its inception in 2014. For situations where Apple Pay isn’t accepted, the tech firm created a sleek-looking, minimalist titanium card. It has just the user's name, etched with lasers, without card numbers or other sensitive information. The Apple Card pays 2 percent in cash back on Apple Pay transactions, 3 percent on direct Apple purchases, and 1 percent on purchases with the physical card. The card is a step into new territory for both companies. Apple is trying to develop new revenue sources beyond its popular hardware products. For Goldman Sachs, its first credit card would continue a nascent push into consumer financial products after spending most of its 150-year history catering to institutional investors, corporations and governments. Goldman Sachs Chief Executive Officer David Solomon attended the Apple event in Cupertino, California, a person with knowledge of his plans told CNBC. 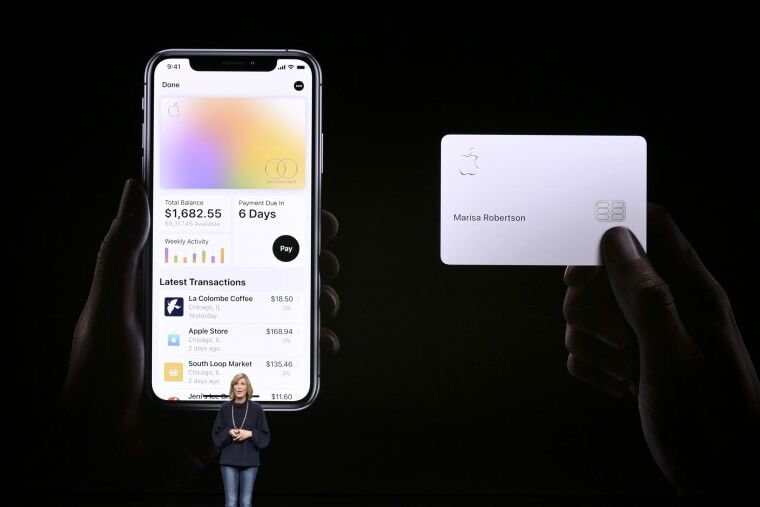 “Because this card is so integrated with Apple Pay, you need to be an iPhone user to maximize your benefits," said Ted Rossman, industry analyst at CreditCards.com. "At a time when Apple’s phone market share is declining, it’s a bit surprising to see Apple doubling down here." "People will sign up for it, but that will be mostly because they love Apple, not because this card is better than anything that already exists,” said Rossman.